For other people named Kenny Johnson, see Kenny Johnson (disambiguation). Kenneth Allen "Kenny" Johnson (born July 13, 1963) is an American actor, producer, and model. He is known for his roles as Detective Curtis Lemansky in The Shield, Butch "Burner" Barnes in Pensacola: Wings of Gold, Detective Ham Dewey in Saving Grace, Herman Kozik in Sons of Anarchy, Matt Webb in Prime Suspect, and Caleb Calhoun in Bates Motel. Johnson currently portrays Dominic Luca in the CBS drama series S.W.A.T..
Johnson was born in New Haven, Connecticut and was raised on a 30-acre farm in Weathersfield, Vermont. For his college education, he attended Central Connecticut State University, where he played football and basketball. Prior to starting his acting career, Johnson spent approximately four years modelling for agencies including Wilhelmina and Ford Models. This path led to him living for a year in Boston, Massachusetts, before finally settling in Los Angeles, California, where he eventually found acting. Johnson got his start in television commercials, including one of the very first ads for LA Gear. A former champion arm wrestler, he appeared as bit characters in various television programs, such as Family Matters, Grace Under Fire, Caroline in the City, Pensacola: Wings of Gold, Sliders, 18 Wheels of Justice, Just Shoot Me!, NCIS: Los Angeles, Lie to Me, Law & Order: Special Victims Unit and The Protector. In 1998, he appeared in the first several minutes of the first Blade, as Heatseeking Dennis, who was saved from a vampire played by Traci Lords. In October 2005, he appeared in the Smallville season 5 episode "Mortal" as metahuman Tommy Lee. He also appeared in the 2006 Hallmark Channel original film Desolation Canyon, with Stacy Keach and Patrick Duffy. Johnson then starred in the 2005 film Zzyzx, a thriller about two friends who take a detour on their way to Las Vegas. Johnson originally auditioned for the role of ill-fated Terry Crowley in The Shield, which ultimately went to Reed Diamond. Casting directors were so impressed with his audition that they asked Johnson to come in for the role of Curtis Lemansky. He was unsure of how to go about the character, as the role was not very developed at that point. During the audition, Johnson made some choices for the character that he initially thought ruined his chances of winning the role. However, the audition turned out to be successful and he was cast. Lemansky quickly became a major player in the first season because of the chemistry Johnson shared with his castmates. After The Shield, Johnson had recurring roles in Cold Case, first as a supposed murder victim, and later as a love interest for Lilly Rush. He was later cast in the TNT series Saving Grace, as Detective Hamilton "Ham" Dewey. Johnson also appeared during the second, third and fourth seasons of Sons of Anarchy as Sgt. At Arms and biker Herman Kozik. He also directed and starred in the short film I Heard the Mermaids Singing. In August 2010, Johnson appeared in the Fox series Lie to Me, along with several fellow cast members from The Shield. In 2011, Johnson appeared in Lifetime's series The Protector, with fellow Sons of Anarchy co-star Ally Walker. Johnson also appeared as a regular in NBC's crime drama series Prime Suspect, playing the contractor boyfriend of the lead character, Detective Jane Timoney (Maria Bello). Also in 2011, Johnson starred as Frank Connor, a convicted drug smuggler who leaves prison after 22 years for one youthful mistake, in Few Options. In 2012, he guest starred as Tyler Gray in the sixth season of Burn Notice, and as Greg Marshall in the fourth season of The Mentalist. That following year, Johnson portrayed U.S. Marshal Max Clayton in the eighth and final season of Dexter. Johnson appeared as Caleb Calhoun, the estranged brother of Norma Bates (Vera Farmiga), in the A&E drama-thriller series Bates Motel. He recurred in the second season, became a main cast member for the third season, and guest starred in the fourth and fifth seasons. He was then a recurring cast member in the fifth season of Covert Affairs, playing former CIA paramilitary operative James Decker. Johnson co-starred in the 2015 thriller film Solace. In August 2015, it was reported that Johnson would be part of the main cast for the second season of ABC's anthology series Secrets and Lies. As of autumn 2017, Johnson portrays Officer Dominique Luca in the CBS drama series S.W.A.T., based on the 2003 film of the same name, but the series also closely follows the original 1975-76 ABC series, also of the same name. The show's theme, written by Barry DeVorzon, is also from the original ABC 1970s series and became a Billboard #1 hit for Rhythm Heritage in 1976. Johnson married Cathleen Oveson on December 21, 2005 in Maui, Hawaiian Islands. The couple has one child. 1993 Family Matters Gorgeous Waiter Episode: "Walk on the Wild Side"
1994 Grace Under Fire Skip Episode: "June 15, 1997"
1994 Something Wilder Chad Episode: "Love Native American Style"
1996 Pacific Blue Deke Episode: "Over the Edge"
1996 Caroline in the City Blair Episode: "Caroline and the Ex-Wife"
1996 The Big Easy George Stodermayer Episode: "Stodermayer"
1996 Sliders Slain Skater Episode: "The Dream Masters"
1996 The Burning Zone Dr. Jake Lietman Episode: "Blood Covenant"
1999 Just Shoot Me Brian McDonald Episode: "The Odd Couple (Part 2)"
1999 Ryan Caulfield: Year One Detective Billy Zabo Episode: "A Night at the Gashole"
2001 18 Wheels of Justice Sonny Episode: "Crossing the Line"
2002 One on One Brandon Episode: "The Way You Make Me Feel"
2003 Boomtown Robert "Bobby" Cherry Episode: "Haystack"
2005 Smallville Tommy Lee Episode: "Mortal"
2006 CSI: Crime Scene Investigation Randy Bolen Episode: "Time of Your Death"
2010 NCIS: Los Angeles Tommy Boyd Episode: "Past Lives"
2010 Lie to Me Malcolm Hessler Episode: "Pied Piper"
2011 Law & Order: Special Victims Unit Detective Sean Riggs Episode: "Dirty"
2011 The Protector Detective Cummings Episode: "Help"
2012 The Mentalist Greg Marshall Episode: "So Long, and Thanks for All the Red Snapper"
2014 Castle Mr. Harden Episode: "In the Belly of the Beast"
2014 Motive Doug Slater Episode: "For You I Die"
^ a b c Fielding, Julien R. (October 27, 2011). "Kenny Johnson". Fielding on Film. ^ Sikes, Rex (January 12, 2012). "Kenny Johnson – Actor". Milwaukee Magazine. ^ "Rex Sikes' Movie Beat chats with actor Kenny Johnson of The Shield & Saving Grace". Blog Talk Radio. ^ Rose, Lacey (July 21, 2011). "'Prime Suspect' Casts 'The Shield's' Kenny Johnson". The Hollywood Reporter. ^ Ng, Philiana (July 25, 2012). "'Burn Notice' Recruits 'Shield' Star for Season 6 (Exclusive)". The Hollywood Reporter. ^ Gelman, Vlada (April 12, 2012). "TVLine Items: Shield Vet Tapped as Mentalist Ex, Fox Doubles Up on Hell's Kitchen and More!". TVLine. ^ Ausiello, Michael (May 11, 2013). "Dexter Exclusive: The Shield's Kenny Johnson Imposes Marshall Law on Season 8". TVLine. ^ D'Alessandro, Anthony. "Comic-Con: Kenny Johnson Upped to Series Regular & Nicola Peltz Returns To 'Bates Motel'". Deadline Hollywood. Retrieved July 25, 2014. ^ Ng, Philiana (August 19, 2014). "'Covert Affairs' Recruits 'The Shield' Star for Season 5 (Exclusive)". The Hollywood Reporter. ^ Iannucci, Rebecca (August 6, 2015). "Secrets and Lies Taps Shield Vet as Season 2 Murder Suspect". TVLine. ^ Petski, Denise (March 1, 2017). "'S.W.A.T. ': Lina Esco & Kenny Johnson Join CBS Drama Pilot Inspired By Movie". Deadline Hollywood. ^ Billboard Charts Archives Online. Retrieved November 30, 2018. ^ "Kenny Johnson and Wife Expecting First Child". People. October 8, 2008. ^ Leon, Anya (May 11, 2009). "Saving Grace's Kenny Johnson Welcomes Daughter Angelica Scarlet". People. 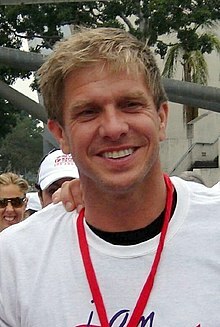 Wikimedia Commons has media related to Kenny Johnson. This page was last edited on 31 December 2018, at 20:19 (UTC).